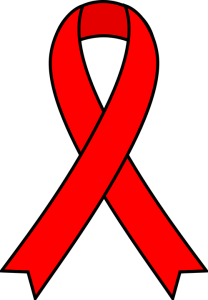 World AIDS Day—which became the first ever global health day in 1988—recognized 30 years this past December 1st. Since HIV/AIDS became a public health concern in 1981, over 35 million people have died from AIDS-related complications worldwide. An estimated 940,000 people died from HIV-related causes in 2017 alone. At the beginning of 2018, approximately 36.9 million people were living with HIV, with 1.8 million newly diagnosed in the year prior. The World Health Organization (WHO) estimates that only 75% of people with HIV are aware of their status. AIDS (Acquired Immune Deficiency Syndrome) is the advanced stage of HIV (Human Immunodeficiency Virus) which can be transmitted through the exchange of bodily fluids, most commonly through sexual contact or transfusing blood unsafely (i.e., intravenous drug use) with someone who is infected. A mother could also transmit the virus to their child during pregnancy, birth, or breastfeeding. The HIV infection attacks the immune system until an opportunistic infection such as certain kinds of pneumonia, toxoplasmosis, as well as rare cancers and brain illnesses are contracted, at which time the diagnosis has progressed to AIDS. There is no cure for HIV or AIDS, though there are life-extending treatments. In the US, 1.1 million people were living with HIV in 2015 (the most recent year the information was available)—with over 15% of whom were unaware. In late 2017, President Trump fired the Presidential Advisory Council on HIV/AIDS (PACHA) which concerned advocates believe is part of an “effort to erase LGBTQ people.” The mass dismissal followed six members resigning the previous summer, citing the Trump administration’s apparent disinterest in helping the HIV/AIDS community. This year the Trump administration has proposed eliminating funding for AIDS Education and Training Centers (AETCs) and Special Projects of National Significance (SPNS), as well as cutting funds for the Housing Opportunities for Persons with AIDS (HOPWA) program, and domestic HIV/AIDS research and prevention efforts. AETCs and SPNS are essential for pioneering, evaluating, and implementing innovative HIV care models for vulnerable populations that are disproportionately affected by HIV including transgender women, gay men, and people of color; HOPWA gives grants to states, nonprofit organizations, and local communities to fund projects that help low-income people living with HIV find and maintain affordable housing. World AIDS Day may be once a year, but you can still support people living with HIV all year. While others work towards an AIDS-free generation, NeedyMeds has information for those looking for help with a diagnosis. In a previous blog post we have outlined Ryan White HIV/AIDS Programs . The NeedyMeds website also has a Disease Information Page for HIV/AIDS with links to other resources . There we list the medications often prescribed, some of which offer drugs at low- or no cost through Prescription Assistance Programs. For those ineligible for a program’s unique guidelines, the NeedyMeds Drug Discount Card is available to help save patients money on their medication. We also link users to the Diagnosis-Based Assistance available for those in need and camps for those affected by the illness. For more help finding information, call our toll-free helpline at 1-800-503-6897 available Monday through Friday 9am to 5pm Eastern Time.